We already knew that Metro Exodus was getting real-time ray tracing effects courtesy of Nvidia’s Turing graphics cards, but it’s also getting access to the deep learning super sampling (DLSS) feature which boosts gaming performance courtesy of our future robot overlords. 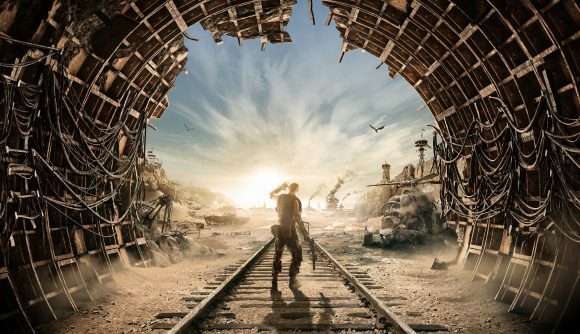 But back to today, and Nvidia has officially announced that right from the game’s launch on Friday February 15, Metro Exodus is getting both ray tracing and DLSS features. That ties in nicely with the release of a DLSS update to Battlefield V this week too. At its most basic DLSS uses the AI power of an Nvidia-powered supercomputer to know what a high resolution image should look like. It then tells your RTX-enabled 20-series GPU, and means that even when your PC is running a compatible game at a lower resolution it can upscale and make it look almost as good as native. That’s the elevator pitch, but basically the DLSS information is created by feeding the Saturn V supercomputer countless ‘perfect’ images of the specific game – and similar games – in order to teach it exactly what the idealised version of here, Metro Exodus, should look. The data is then downloaded along with the new Nvidia drivers and, at a local level, feeds the high-res image info gleaned from Saturn V into the Tensor Cores of your RTX card. That data informs the AI smarts of your Turing GPU and tells it how to super-sample a lower resolution image and make it look practically indistinguishable from a native image. The end result is a game which looks great and plays even better. Though AMD might just disagree on the finer points of the DLSS benefits. Nvidia estimates that in Metro Exodus you will be getting up to 30% extra performance using DLSS in conjunction with the Ultra preset and RTX ray tracing enabled. It will also continue to tune the DLSS feature over time, feeding the Saturn V monster more information to create better in-game results. And hopefully distract from its inevitable goal: ending the world. The ray tracing effects in Metro Exodus are being used in a different way to Battlefield V. There DICE was using Microsoft’s DirectX Raytracing API and Nvidia’s RTX tech to achieve realistic reflections, while 4A Games is to add more realistic lighting to the latest Metro. That means ray traced ambient occlusion and global illumination to improve the way light spills around the game world. 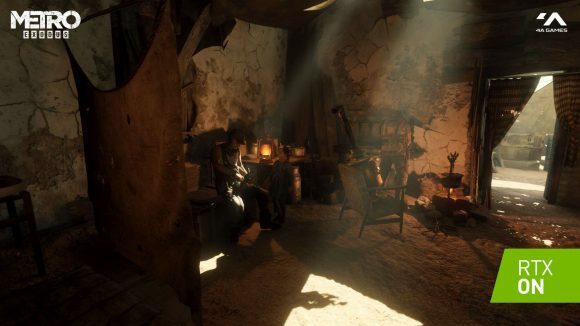 It’s subtle, and Nvidia claims “the biggest contribution ray tracing makes to Metro Exodus is a feeling.” That’s admittedly a bit nebulous, but still, Metro Exodus does look stunning with all the pretties enabled.